Psychrophiles or cryophiles (adj. psychrophilic or cryophilic) are extremophilic organisms that are capable of growth and reproduction in low temperatures, ranging from −20 °C to +10 °C. They are found in places that are permanently cold, such as the polar regions and the deep sea. They can be contrasted with thermophiles, which are organisms that thrive at unusually high temperatures. Psychrophile is Greek for 'cold-loving'. Many such organisms are bacteria or archaea, but some eukaryotes such as lichens, snow algae, fungi, and wingless midges, are also classified as psychrophiles. The lichen Xanthoria elegans can continue to photosynthesize at −24 °C. The cold environments that psychrophiles inhabit are ubiquitous on Earth, as a large fraction of our planetary surface experiences temperatures lower than 15 °C. They are present in permafrost, polar ice, glaciers, snowfields and deep ocean waters. These organisms can also be found in pockets of sea ice with high salinity content. Microbial activity has been measured in soils frozen below −39 °C. In addition to their temperature limit, psychrophiles must also adapt to other extreme environmental constraints that may arise as a result of their habitat. These constraints include high pressure in the deep sea, and high salt concentration on some sea ice. Psychrophiles are protected from freezing and the expansion of ice by ice-induced desiccation and vitrification (glass transition), as long as they cool slowly. Free living cells desiccate and vitrify between −10 °C and −26 °C. Cells of multicellular organisms may vitrify at temperatures below −50 °C. The cells may continue to have some metabolic activity in the extracellular fluid down to these temperatures, and they remain viable once restored to normal temperatures. They must also overcome the stiffening of their lipid cell membrane, as this is important for the survival and functionality of these organisms. To accomplish this, psychrophiles adapt lipid membrane structures that have a high content of short, unsaturated fatty acids. Compared to longer saturated fatty acids, incorporating this type of fatty acid allows for the lipid cell membrane to have a lower melting point, which increases the fluidity of the membranes. In addition, carotenoids are present in the membrane, which help modulate the fluidity of it. Antifreeze proteins are also synthesized to keep psychrophiles' internal space liquid, and to protect their DNA when temperatures drop below water's freezing point. By doing so, the protein prevents any ice formation or recrystallization process from occurring. The enzymes of these organisms have been hypothesized to engage in a activity-stability-flexibility relationship as a method for adapting to the cold; the flexibility of their enzyme structure will increase as a way to compensate for the freezing effect of their environment. Certain cryophiles, such as Gram-negative bacteria Vibrio and Aeromonas spp., can transition into a viable but nonculturable (VBNC) state. During VBNC, a micro-organism can respirate and use substrates for metabolism – however, it cannot replicate. An advantage of this state is that it is highly reversible. It has been debated whether VBNC is an active survival strategy or if eventually the organism's cells will no longer be able to be revived. There is proof however it may be very effective – Gram positive bacteria Actinobacteria have been shown to have lived about 500,000 years in the permafrost conditions of Antarctica, Canada, and Serbia. The wingless midge (Chironomidae) Belgica antarctica. Psychrophiles include bacteria, lichens, fungi, and insects. Among the bacteria that can tolerate extreme cold are Arthrobacter sp., Psychrobacter sp. and members of the genera Halomonas, Pseudomonas, Hyphomonas, and Sphingomonas. Another example is Chryseobacterium greenlandensis, a psychrophile that was found in 120,000-year-old ice. Umbilicaria antarctica and Xanthoria elegans are lichens that have been recorded photosynthesizing at temperatures ranging down to −24 °C, and they can grow down to around −10 °C. Some multicellular eukaryotes can also be metabolically active at sub-zero temperatures, such as some conifers; those in the Chironomidae family are still active at −16 °C. Penicillium is a genus of fungi found in a wide range of environments including extreme cold. Among the psychrophile insects, the Grylloblattidae or icebugs, found on mountaintops, have optimal temperatures between 1-4 °C. 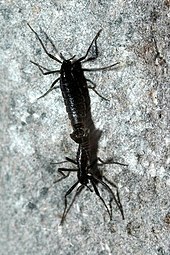 The wingless midge (Chironomidae) Belgica antarctica can tolerate salt, being frozen and strong ultraviolet, and has the smallest known genome of any insect. The small genome, of 99 million base pairs, is thought to be adaptive to extreme environments. Psychrotrophic bacteria are capable of surviving or even thriving in extremely cold environment. They provide an estimation of the product's shelf life, also they can be found in soils, in surface and deep sea waters, in Antarctic ecosystems, and in foods. They are responsible for spoiling refrigerated foods. Psychrotrophic bacteria are of particular concern to the dairy industry. Most are killed by pasteurization; however, they can be present in milk as post-pasteurization contaminants due to less than adequate sanitation practices. According to the Food Science Department at Cornell University, psychrotrophs are bacteria capable of growth at temperatures at or less than 7 °C (44.6 °F). At freezing temperatures, growth of psychrotrophic bacteria becomes negligible or virtually stops. All three subunits of the RecBCD enzyme are essential for physiological activities of the enzyme in the Antarctic Pseudomonas syringae, namely, repairing of DNA damage and supporting the growth at low temperature. The RecBCD enzymes are exchangeable between the psychrophilic P. syringae and the mesophilic E. coli when provided with the entire protein complex from same species. However, the RecBC proteins (RecBCPs and RecBCEc) of the two bacteria are not equivalent; the RecBCEc is proficient in DNA recombination and repair, and supports the growth of P. syringae at low temperature, while RecBCPs is insufficient for these functions. Finally, both helicase and nuclease activity of the RecBCDPs are although important for DNA repair and growth of P. syringae at low temperature, the RecB-nuclease activity is not essential in vivo. In 1940, ZoBell and Conn stated that they had never encountered "true psychrophiles" or organisms that grow best at relatively low temperatures. In 1958, J. L. Ingraham supported this by concluding that there are very few or possibly no bacteria that fit the textbook definitions of psychrophiles. Richard Y. Morita emphasizes this by using the term psychrotroph to describe organisms that do not meet the definition of psychrophiles. The confusion between the terms psychrotrophs and psychrophiles was started because investigators were unaware of the thermolability of psychrophilic organisms at the laboratory temperatures. Due to this, early investigators did not determine the cardinal temperatures for their isolates. The similarity between these two is that they are both capable of growing at zero, but optimum and upper temperature limits for the growth are lower for psychrophiles compared to psychrotrophs. Psychrophiles are also more often isolated from permanently cold habitats compared to psychrotrophs. Although psychrophilic enzymes remain under-used because the cost of production and processing at low temperatures is higher than for the commercial enzymes that are presently in use, the attention and resurgence of research interest in psychrophiles and psychrotrophs will be a contributor to the betterment of the environment and the desire to conserve energy. ^ a b Neufeld, Josh; Clarke, Andrew; Morris, G. John; Fonseca, Fernanda; Murray, Benjamin J.; Acton, Elizabeth; Price, Hannah C. (2013). "A Low Temperature Limit for Life on Earth". PLoS ONE. 8 (6): e66207. Bibcode:2013PLoSO...866207C. doi:10.1371/journal.pone.0066207. PMC 3686811. PMID 23840425. ^ a b Barták, Miloš; Váczi, Peter; Hájek, Josef; Smykla, Jerzy (2007). "Low-temperature limitation of primary photosynthetic processes in Antarctic lichens Umbilicaria antarctica and Xanthoria elegans". Polar Biology. 31 (1): 47–51. doi:10.1007/s00300-007-0331-x. ^ a b c D'Amico, Salvino; Tony Collins; Jean-Claude Marx; Georges Feller; Charles Gerday (2006). "Psychrophilic Microorganisms: Challenges for Life". EMBO Rep EMBO Reports. 7 (4): 385–9. doi:10.1038/sj.embor.7400662. PMC 1456908. PMID 16585939. ^ Panikov, N.S. ; Flanagan, P.W. ; Oechel, W.C.; Mastepanov, M.A. ; Christensen, T.R. (2006). "Microbial activity in soils frozen to below −39°C". Soil Biology and Biochemistry. 38 (4): 785–794. doi:10.1016/j.soilbio.2005.07.004. ^ Feller, Georges; Gerday, Charles (December 2003). "Psychrophilic enzymes: hot topics in cold adaptation". Nature Reviews Microbiology. 1 (3): 200–208. doi:10.1038/nrmicro773. PMID 15035024. ^ Chattopadhyay, M. K.; Jagannadham, M. V. (2003). "A branched chain fatty acid promotes cold adaptation in bacteria". Journal of Biosciences. 28 (4): 363–364. doi:10.1007/bf02705110. ^ a b Chattopadhyay, M. K. (2006). "Mechanism of bacterial adaptation to low temperature". Journal of Biosciences. 31: 157–165. doi:10.1007/bf02705244. ^ Maayer, Pieter De; Anderson, Dominique; Cary, Craig; Cowan, Don A. (May 15, 2015). "Some like it cold: understanding the survival strategies of psychrophiles". EMBO Reports. 15 (5): 508–517. doi:10.1002/embr.201338170. PMC 4210084. PMID 24671034. ^ Li, Laam; Mendis, Nilmini; Trigui, Hana; Oliver, James D.; Faucher, Sebastien P. (2014). "The importance of the viable but non-culturable state in human bacterial pathogens". Frontiers in Microbiology. 5: 258. doi:10.3389/fmicb.2014.00258. PMC 4040921. PMID 24917854. ^ Johnson, Sarah Stewart; Hebsgaard, Martin B.; Christensen, Torben R.; Mastepanov, Mikhail; Nielsen, Rasmus; Munch, Kasper; Brand, Tina; Gilbert, M. Thomas P.; Zuber, Maria T.; Bunce, Michael; Rønn, Regin; Gilichinsky, David; Froese, Duane; Willerslev, Eske (2007). "Ancient bacteria show evidence of DNA repair". Proceedings of the National Academy of Sciences. 104 (36): 14401–5. Bibcode:2007PNAS..10414401J. doi:10.1073/pnas.0706787104. PMC 1958816. PMID 17728401. ^ Siddiqui, Khawar S.; Williams, Timothy J.; Wilkins, David; Yau, Sheree; Allen, Michelle A.; Brown, Mark V.; Lauro, Federico M.; Cavicchioli, Ricardo (2013). "Psychrophiles". Annual Review of Earth and Planetary Sciences. 41: 87–115. Bibcode:2013AREPS..41...87S. doi:10.1146/annurev-earth-040610-133514. ^ Clarke, Andrew (2014). "The thermal limits to life on Earth" (PDF). International Journal of Astrobiology. 13 (2): 141–154. Bibcode:2014IJAsB..13..141C. doi:10.1017/S1473550413000438. ^ Riou-Nivert, Philippe (2001). Les résineux - Tome 1 : connaissance et reconnaissance. Institut pour le développement forestier. p. 79. ^ Kohshima, Shiro (1984). "A novel cold-tolerant insect found in a Himalayan glacier". Nature. 310 (5974): 225–227. Bibcode:1984Natur.310..225K. doi:10.1038/310225a0. ^ Gupta, G.N. ; Srivastava, S.; Khare, S.K. ; Prakash, V. (2014). "Extremophiles: An Overview of Microorganism from Extreme Environment". International Journal of Agriculture, Environment and Biotechnology. 7 (2): 371. doi:10.5958/2230-732x.2014.00258.7. ^ Gough, Zoe (12 August 2014). "Antarctic midge has smallest insect genome". BBC. Retrieved 14 January 2018. ^ Druce, R. G.; Thomas, S. B. (1970). "An Ecological Study of the Psychrotrophic Bacteria of Soil, Water, Grass and Hay". Journal of Applied Bacteriology. 33 (2): 420–435. doi:10.1111/j.1365-2672.1970.tb02215.x. ^ Radjasa, Ocky Karna; Urakawa, Hidetoshi; Kita-Tsukamoto, Kumiko; Ohwada, Kouichi (2001). "Characterization of Psychrotrophic Bacteria in the Surface and Deep-Sea Waters from the Northwestern Pacific Ocean Based on 16S Ribosomal DNA Analysis". Marine Biotechnology. 3 (5): 454–462. doi:10.1007/s10126-001-0050-1. PMID 14961338. ^ "Psychrotrophic Bacteria in Foods: Disease and Spoilage. - Food Trade Review". Encyclopedia.com. 1993-09-01. Retrieved 2010-09-01. ^ Steven C. Murphy, "Shelf LIfe of Fluid Milk Products -- Microbial Spoilage", Food Science Department, Cornell University.. Retrieved 22 November 2009. ^ Pavankumar, Theetha L.; Sinha, Anurag K.; Ray, Malay K. (2010). "All Three Subunits of RecBCD Enzyme Are Essential for DNA Repair and Low-Temperature Growth in the Antarctic Pseudomonas syringae Lz4W". PLOS ONE. 5 (2): e9412. Bibcode:2010PLoSO...5.9412P. doi:10.1371/journal.pone.0009412. PMC 2828478. PMID 20195537. ^ Ingraham, J. L. (1958). "Growth of psychrophilic bacteria". Journal of Bacteriology. 76 (1): 75–80. PMC 290156. PMID 13563393. ^ Morita, Richard Y. (1975). "Psychrophilic bacteria". Bacteriological Reviews. 39 (2): 144–67. PMC 413900. PMID 1095004. ^ a b Russell, N. J.; P. Harrisson; I. A. Johnston; R. Jaenicke; M. Zuber; F. Franks; D. Wynn-Williams (1990). "Cold Adaptation of Microorganisms [and Discussion]". Philosophical Transactions of the Royal Society of London. Series B Biological Sciences. 326 (1237, Life at Low Temperatures): 595–611. Bibcode:1990RSPTB.326..595R. doi:10.1098/rstb.1990.0034. JSTOR 2398707. PMID 1969649. Bej, Asim K.; Jackie Aislabie; Ronald M. Atlas (15 December 2009). Polar Microbiology: The Ecology, Biodiversity and Bioremediation Potential of Microorganisms in Extremely Cold Environments. Crc Pr Inc. ISBN 978-1420083842. Murata, Yoshinori; et al. (2006). "Genome-wide expression analysis of yeast response during exposure to 4C". Extremophiles. 10 (2): 117–128. arXiv:1109.6589. Bibcode:2011Extrm..15..633A. doi:10.1007/s00792-005-0480-1. PMID 16254683. Mikucki, J. A.; et al. (2009). "A contemporary microbially maintained subglacial ferrous 'ocean'". Science. 324 (5925): 397–400. Bibcode:2009Sci...324..397M. doi:10.1126/science.1167350. PMID 19372431. Sandle, T.; Skinner, K. (2013). "Study of psychrophilic and psychrotolerant microorganisms isolated in cold rooms used for pharmaceutical processing". Journal of Applied Microbiology. 114 (4): 1166–1174. doi:10.1111/jam.12101. PMID 23216715. This page was last edited on 8 April 2019, at 13:37 (UTC).